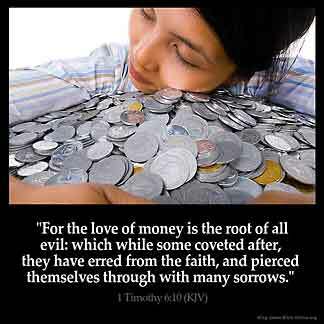 1 TIMOTHY 6:10 KJV "For the love of money is the root of all evil: which while some coveted after, they have erred from the..."
For the loue of money is the root of all euill, which while some coueted after, they haue erred from the faith, and pierced themselues through with many sorrowes. For the rote of alle yuelis is coueytise, which summen coueitinge erriden fro the feith, and bisettiden hem with many sorewis. 6:10 Love of money - Commonly called prudent care of what a man has. Is the root - The parent of all manner of evils. Which some coveting have erred - Literally, missed the mark. They aimed not at faith, but at something else. And pierced themselves with many sorrows - From a guilty conscience, tormenting passions, desires contrary to reason, religion, and one another. How cruel are worldly men to themselves! 1Ti 6:10 For the love of money is the root of all evil. Not the money itself, which if used as by a steward of God is a blessing, so much as the love of it. This greedy love is the source of every sin. Men murder, cheat, lie, rob, run saloons, gambling houses, brothels, all for the love of money. For love of money Judas sold his Master. Some . . . have erred from the faith. Have wandered from the faith through the love of money. Judas is one example. If a person places their desire to have more money first in their lives, they are choosing not to put God first. When this happens their minds loose focus on God's will for their lives. Their focus is then easily pulled towards evil easy ways to obtain more money. The love for money goes beyond the need for money. Only God can help our hearts to keep our priorities right but it must be a work we do on ourselves by understanding our needs, that God provides it to us for our good, that we dont have extort others because of it. I thank you have put money in its proper place the problem is that some people try too solve money with every thing and you cannot do that. first mosthigh must come and center point blank. these things. God will take care of the rest. Halaluyah! The scripture has made it known to us that the power of greed and the love of money hanker our lives to all kind of evil which ends in brutality and as well hell. We are ment to understand that, it is the love bestow on money not money itself, for the book of ecclesiastis 10 vers 19. Says that money answereth all things, that means that money is good but not for love. God bless you. I enjoy this scripture because it shows how the love of money leads to all types of evil. People murder for money, steal for money, lie for money, sell themselves for money, betray their friends and family for money and so many other evil things. Money in itself is not bad. In fact Ecclesiastes 7:12 brings out how money is a protection. It's when people place the love of money above all else that leads to the various types of evil.